The UK Ministry of Defence has extended its containerised deployable systems support contract, Project Amphora, with Marshall Aerospace and Defence Group for a further three years. 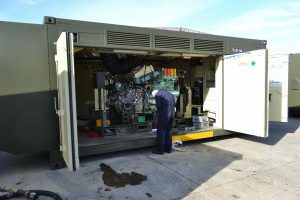 For the last four years Marshall, along with its partner G3 Systems, has been tasked with refurbishing and re-engineering a range of shelters, ensuring that the deployable shelter systems are fully supported to demanding operational levels while extending the equipment’s useful life. Under Project Amphora the Marshall team has extended the life of the Power Pack Repair Facility and brought it up to the latest electrical standards. “Amphora has delivered significant financial and delivery efficiencies in its initial four year term, benefiting all our Front Line Commands; it was an obvious choice to extend the contract to build on these early successes. I look forward to our teams continuing to work together to achieve even more over the next three years,” said Sam Rawle, Head of Operational Infrastructure at DE&S, the MoD’s procurement body. During the current period of the contract the Marshall team has worked on 13 different shelter systems, refurbishing and bringing the systems up to the latest standards. Among the systems that have received life extensions are Tardis, a mobile intelligence system, the Power Pack Repair Facility (PPRF), which the team has re-generated and brought up to the latest electrical standards and the Deployable Engineering Workshop which has similarly had its life extended. “The extension to the Amphora support contract is a real vote of confidence in the team. It has come about through hard work, focusing on the task and most importantly through integrity and honesty, which has been demonstrated by the close working relationship between the two teams to deliver real value for money for the taxpayer,” said Alistair McPhee, Chief Executive of Marshall Aerospace and Defence Group.